Like most mystery writers, I grew up marinating my brain in unsuitable material— Edgar Allan Poe, The Nightstalker, the lurid photographs in my mother’s nursing textbooks. I whetted my appetite for the edgy and unsavory in every medium that the library and late night movies would allow, but I also stole liberally from my mother’s stack of bodice-ripping romance novels. Soon my imagination brimmed with stories of carnal appetites savory and otherwise, populated with intrepid heroes and feisty heroines and more than a few corpses. Such is my literary resume. But my Muse is a different creature altogether. Separate from me, yet intimately collected, my Muse is my constant creative companion. I capitalize the word deliberately, as I would a proper name, because that’s how the relationship feels to me — like two individuals working for a common cause. I did not choose my Muse any more than I chose my best friend; our partnership evolved organically, and I work hard to honor and nurture it (which usually involves massages, good wine, and naps, so no hardship there). 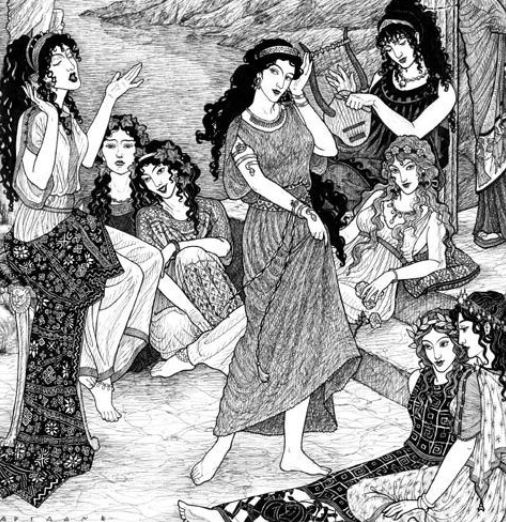 I subscribe whole-heartedly to the idea of the Muse as an entity separate from the artist (I’m in love with artist Thalia Took’s image of the Greek Muses celebrating their individual and collected magnificence — imagine yourself in the center of that circle and you’ll feel the power, I guarantee). The Muses are here to engage our best selves. As writer Elizabeth Gilbert, author of Eat Pray Love, describes it, “there’s a contract between you and the mystery.” She encourages modern day creatives to drop that idea of genius as something only a select few possess, and to think instead of genius as a separate intelligence that visits us in order to inspire and assist with some creative act. This is exactly how working with my Muse feels to me — cooperative, mysterious, energizing. It’s a multi-sensory experience. Sometimes I feel as if I’m eavesdropping on my characters, jotting down their words and whispers. Sometimes the feeling is visual — a singular image, like blood on snow, that I just have to explore. And sometimes it feels downright spooky, like when I feel a pull toward a certain magazine or book only to flip it open to exactly the piece of research I’ve been desperate to find. I can’t explain it . . . and I wouldn’t want to. Trying to cram the experience into a formula would ruin the magic. And it is magic — powerful, alchemical, transforming. Humans are storymaking creatures, and to be able to share in that age-old process is a gift and a privilege. So take a bow, fellow creatives, and make welcome your own Muse. It will be the start of a beautiful relationship, I promise. 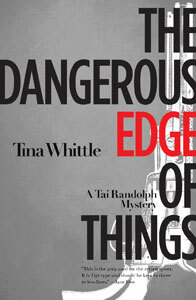 Tina Whittle’s Tai Randolph series — featuring intrepid gunshop owner Tai and her corporate security agent partner Trey Seaver — has garnered starred reviews in Kirkus, Publisher’s Weekly, Booklist, and Library Journal. 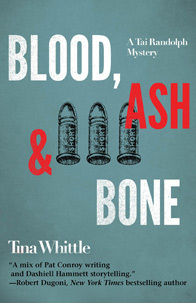 Described as “cozy noir,” the third book in the series — Blood, Ash and Bone – is available now from Poisoned Pen Press. When not writing or reading, Tina enjoys golf, sushi, mini-pilgrimages, and spending time with her family (one husband, one daughter, one neurotic Maltese and a single bossy chicken). 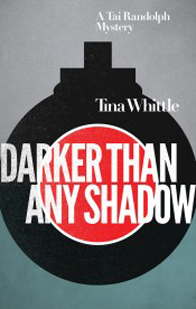 You can find the author online at her official website — www.tinawhittle.com. ~ by Monette Michaels on April 10, 2013. Thank you for having me, Monette! My Muse and I appreciate your letting us visit. Magical, indeed:) Your Muse has obviously served you well. Great blog. Tina– Thanks for being my guest. Can’t wait for the next Tai Randolph book.